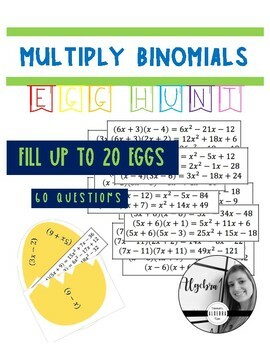 Student will practice multiplying binomials by finding and turning eggs! Take a large Easter egg and break it in half. On the small half, write down the binomial on the left, once. On the longer half of the egg, write down the right, three binomials. [Eggs should rotate around to make three different problems] Then place the strip of paper with the answers inside the egg. Hide the eggs around the room. 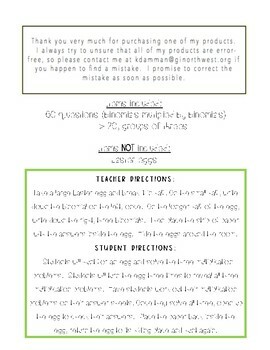 Students will hunt for an egg and solve the three multiplication problems. 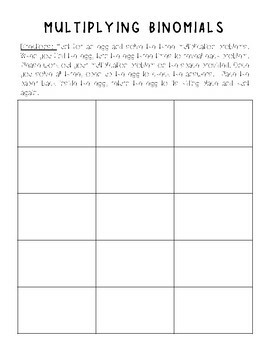 Students will turn the egg three times to reveal all three multiplication problems. 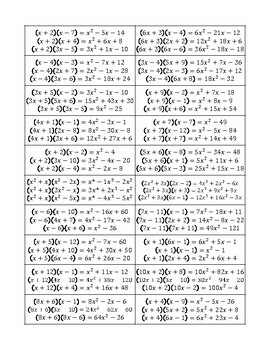 Have students work out their multiplication problems on their answer sheets. Once they solve all three, open up the egg to check their answers. Place the paper back inside the egg, return the egg to its hiding place and hunt again.